Repositionable photo albums with durable black linen covers to display cherished photos, documents, arts and crafts or mementos. Clear PolyGlass pages hold prints or images. Capacity: 10 pages (20 sides). Click on individual items for more specific product information. Add To Cart to view ship rates and delivery dates. 1-Up repositionable photo album with durable black linen cover to display cherished photos, documents, arts and crafts or mementos. Ground orders usually ship in 1-2 business days. 2-Up repositionable photo album with durable black linen cover to display cherished photos, documents, arts and crafts or mementos. Letter size A4 repositionable photo album with durable black linen cover to display cherished photos, documents, arts and crafts or mementos. 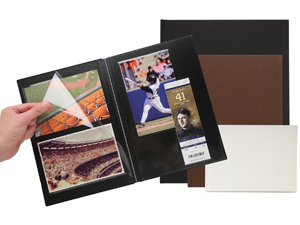 These Itoya Profolio Premium Albums have 10 repositionable photo safe pages with a quality black linen book bound cover and make the perfect archival storage system for your most treasured memories. These repositionable albums replace the old style magnetic albums with a new advanced page technology to display cherished photos, documents, arts and crafts or mementos. The album couldn't be easier to use, and can be used again and again. Simply peel back the crystal clear PolyGlass sheet, set your items on the archival safe, repositionable backing sheet and put the cover sheet back on to safely protect and preserve your memory items. Photos will not permanently stick to the pages and the PolyGlass sheets will not discolor or crack. Great for individual flat items as well as layering items on the same page. Perfect for creating your own photobook. Comes with a Lifetime Guarantee. Note: This album will not accept refill pages.